Gears offer positive transmission of power. Gears range in size from small miniature instrument installations, that measure in only several millimeters in diameter, to huge powerful gears in turbine drives that are several meters in diameter. Gears can provide position transmission with very high angular or linear accuracy; such as used in servomechanisms and military equipment. Gears can couple power and motion between shafts whose axes are parallel, intersecting or skew. This technical section is written as an aid for the designer who is a beginner or only superficially knowledgeable about gearing. It provides fundamental theoretical and practical information. Admittedly, it is not intended for experts. Those who wish to obtain further information and special details should refer to the reference list at the end of this text and other literature on mechanical machinery and components. This technical section is dedicated to details of metric gearing because of its increasing importance. Currently, much gearing in the United States is still based upon the inch system. However, with most of the world metricated, the use of metric gearing in the United States is definitely on the increase, and inevitably at some future date it will be the exclusive system. It should be appreciated that in the United States there is a growing amount of metric gearing due to increasing machinery and other equipment imports. This is particularly true of manufacturing equipment, such as printing presses, paper machines and machine tools. Automobiles are another major example, and one that impacts tens of millions of individuals. Further spread of metric gearing is inevitable since the world that surrounds the United States is rapidly approaching complete conformance. England and Canada, once bastions of the inch system, are well down the road of metrication, leaving the United States as the only significant exception. Thus, it becomes prudent for engineers and designers to not only become familiar with metric gears, but also to incorporate them in their designs. Certainly, for export products it is imperative; and for domestic products it is a serious consideration. The U.S. Government, and in particular the military, is increasingly insisting upon metric based equipment designs. 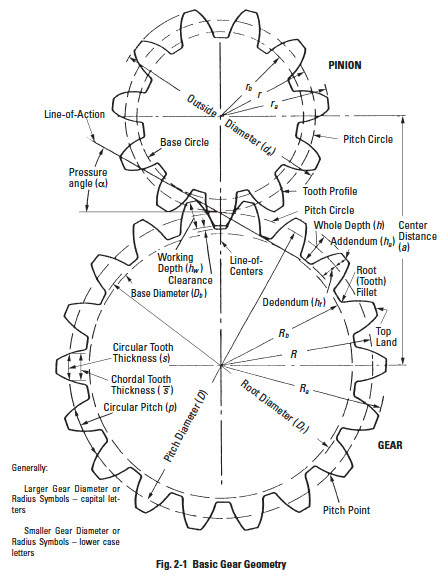 Recognizing that most engineers and designers have been reared in an environment of heavy use of the inch system and that the amount of literature about metric gears is limited, we are offering this technical gear section as an aid to understanding and use of metric gears. In the following pages, metric gear standards are introduced along with information about interchangeability and non interchangeability. Although gear theory is the same for both the inch and metric systems, the formula for metric gearing take on a different set of symbols. These equations are fully defined in the metric system. The coverage is thorough and complete with the intention that this be a source for all information about gearing with definition in a metric format. 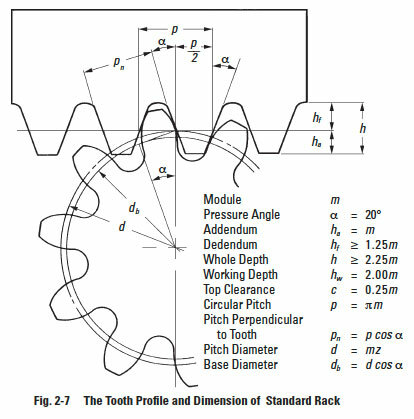 In all modern gear systems, the rack is the basis for tooth design and manufacturing tooling. Thus, the similarities and differences between the two systems can be put into proper perspective with comparison of the metric and inch basic racks. In both systems, the basic rack is normalized for a unit size. For the metric rack it is 1 module, and for the inch rack it is 1 diametral pitch. 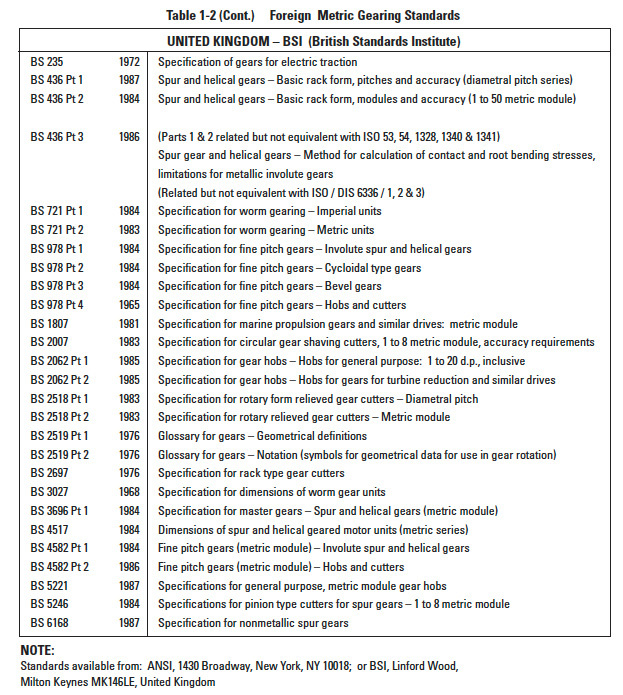 The standard ISO metric rack is detailed in Figure 1-1. It is now the accepted standard for the international community, it having eliminated a number of minor differences that existed between the earlier versions of Japanese, German and Russian modules. For comparison, the standard inch rack is detailed in Figure 1-2. Note that there are many similarities. The principal factors are the same for both racks. Both are normalized for unity; that is, the metric rack is specified in terms of 1 module, and the inch rack in terms of 1 diametral pitch. 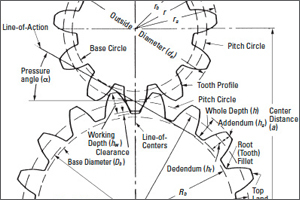 Tooth Form: Straight-sided full depth, forming the basis of a family of full depth interchangeable gears. Pressure Angle: A 20° pressure angle, which conforms to worldwide acceptance of this as the most versatile pressure angle. Addendum: This is equal to the module m, which is similar to the inch value that becomes 1/p. Dedendum: This is 1.25 m ; again similar to the inch rack value. Root Radius: The metric rack value is slightly greater than the American inch rack value. Tip Radius: A maximum value is specified. This is a deviation from the American inch rack which does not specify a rounding. 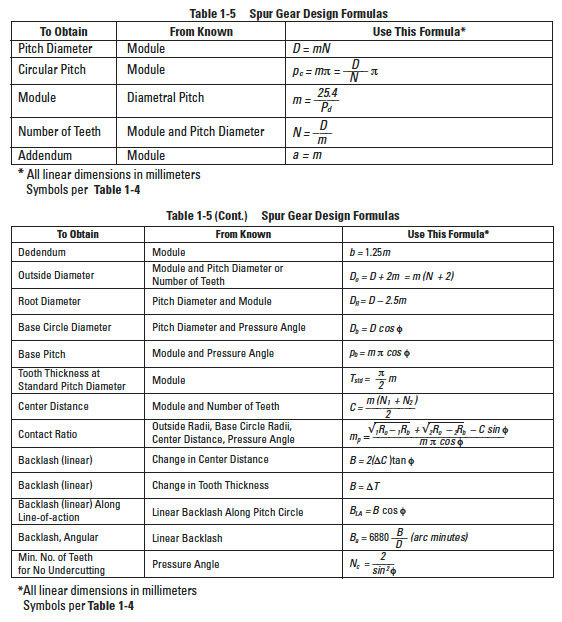 Most gear equations that are used for diametral pitch inch gears are equally applicable to metric gears if the module m is substituted for diametral pitch. However, there are exceptions when it is necessary to use dedicated metric equations. Thus, to avoid confusion and errors, it is most effective to work entirely with and within the metric system. Metric standards have been coordinated and standardized by the International Standards Organization (ISO). A listing of the most pertinent standards is given in Table 1-1. 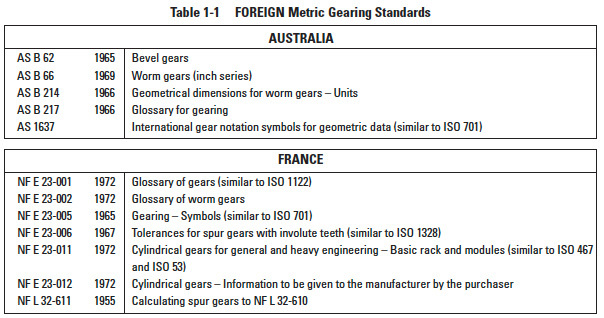 Most major industrialized countries have been using metric gears for a long time and consequently had developed their own standards prior to the establishment of ISO and SI units. In general, they are very similar to the ISO standards. View the key foreign metric standards for Australia and France, Germany, Italy and Japan and United Kingdom. 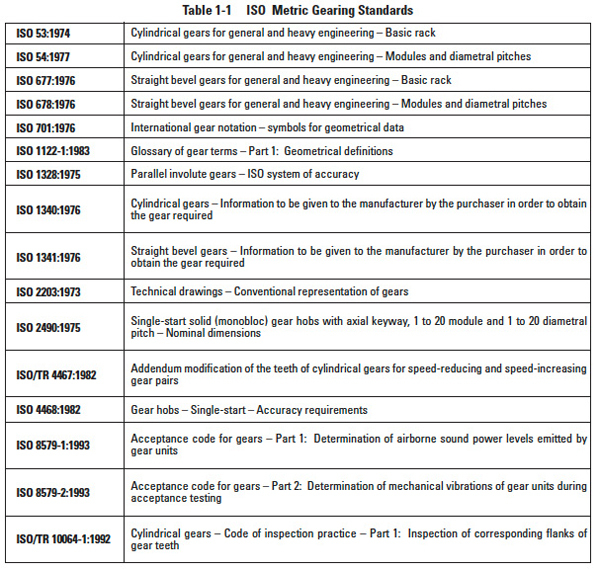 Japanese Industrial Standards (JIS) define numerous engineering subjects including gearing. The originals are generated in Japanese, but they are translated and published in English by the Japanese Standards Association. 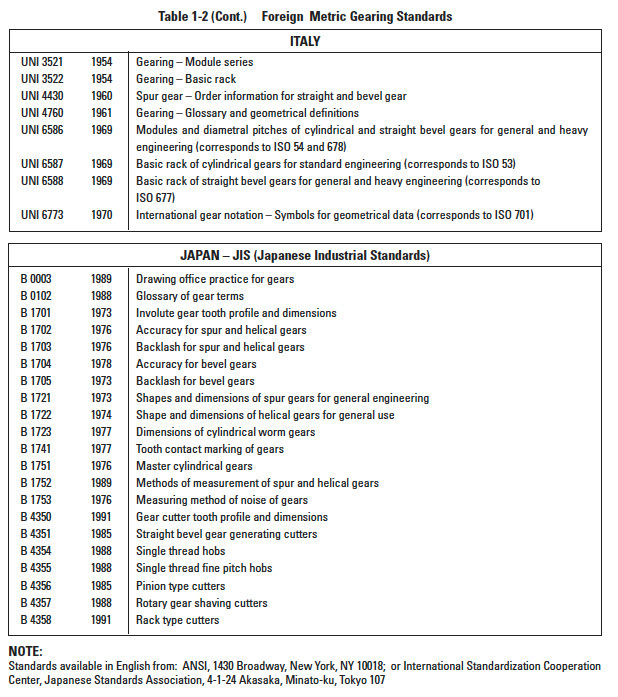 Considering that many metric gears are produced in Japan, the JIS standards may apply. These essentially conform to all aspects of the ISO standards. Gear parameters are defined by a set of standardized symbols that are defined in JIS B 0121 (1983). These are reproduced in Table 1-3. The JIS symbols are consistent with the equations given in this text and are consistent with JIS standards. Most differ from typical American symbols, which can be confusing to the first time metric user. To assist, Table 1-4 is offered as a cross list. Terms used in metric gearing are identical or are parallel to those used for inch gearing. The one major exception is that metric gears are based upon the module, which for reference may be considered as the inversion of a metric unit diametral pitch. Terminology will be appropriately introduced and defined throughout the text. There are some terminology difficulties with a few of the descriptive words used by the Japanese JIS standards when translated into English. 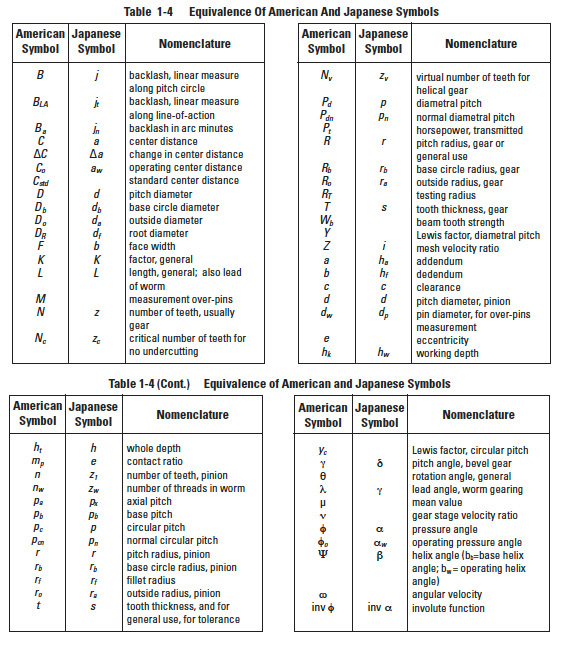 One particular example is the Japanese use of the term "radial" to describe measures such as what Americans term circular pitch. This also crops up with contact ratio. What Americans refer to as contact ratio in the plane of rotation, the Japanese equivalent is called "radial contact ratio". This can be both confusing and annoying. Therefore, since this technical section is being used outside Japan, and the American term is more realistically descriptive, in this text we will use the American term "circular" where it is meaningful. However, the applicable Japanese symbol will be used. Other examples of giving preference to the American terminology will be identified where it occurs. 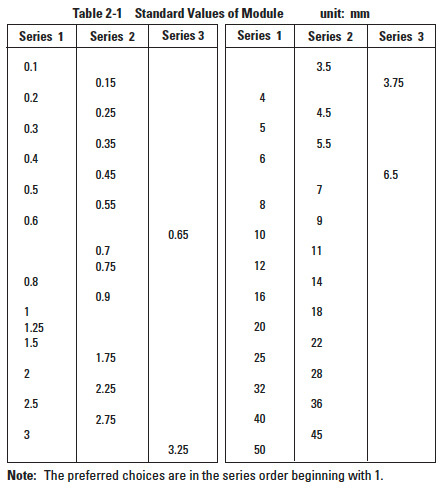 For those wishing to ease themselves into working with metric gears by looking at them in terms of familiar inch gearing relationships and mathematics, Table 1-5 is offered as a means to make a quick comparison. This section presents a technical coverage of gear fundamentals. It is intended as a broad coverage written in a manner that is easy to follow and to understand by anyone interested in knowing how gear systems function. Since gearing involves specialty components, it is expected that not all designers and engineers possess or have been exposed to every aspect of this subject. However, for proper use of gear components and design of gear systems it is essential to have a minimum understanding of gear basics and a reference source for details. For those to whom this is their first encounter with gear components, it is suggested this technical treatise be read in the order presented so as to obtain a logical development of the subject. Subsequently, and for those already familiar with gears, this material can be used selectively in random access as a design reference. The fundamentals of gearing are illustrated through the spur gear tooth, both because it is the simplest, and hence most comprehensible, and because it is the form most widely used, particularly for instruments and control systems. 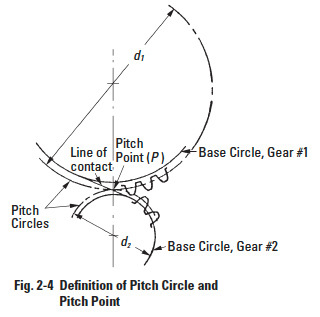 The pitch circle diameters (or pitch diameters). Size of teeth (or module). Details of these items along with their interdependence and definitions are covered in subsequent paragraphs. A primary requirement of gears is the constancy of angular velocities or proportionality of position transmission. Precision instruments require positioning fidelity. High-speed and/ or high-power gear trains also require transmission at constant angular velocities in order to avoid severe dynamic problems. 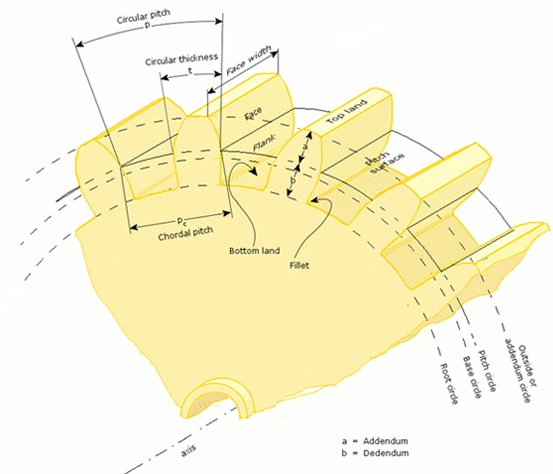 "A common normal to the tooth profiles at their point of contact must, in all positions of the contacting teeth, pass through a fixed point on the line-of-centers called the pitch point." Any two curves or profiles engaging each other and satisfying the law of gearing are conjugate curves. Conjugate action is independent of changes in center distance. The form of the basic rack tooth is straight-sided, and therefore is relatively simple and can be accurately made; as a generating tool it imparts high accuracy to the cut gear tooth. One cutter can generate all gear teeth numbers of the same pitch. The involute curve is most easily understood as the trace of a point at the end of a taut string that unwinds from a cylinder. It is imagined that a point on a string, which is pulled taut in a fixed direction, projects its trace onto a plane that rotates with the base circle. See Figure 2-2. The base cylinder, or base circle as referred to in gear literature, fully defines the form of the involute and in a gear it is an inherent parameter, though invisible. The development and action of mating teeth can be visualized by imagining the taut string as being unwound from one base circle and wound on to the other, as shown in a Figure 2-3a. Thus, a single point on the string simultaneously traces an involute on each base circle's rotating plane. This pair of involutes is conjugate, since at all points of contact the common normal is the common tangent which passes through a fixed point on the line-of-centers. If a second winding/ unwinding taut string is wound around the base circles in the opposite direction, Figure 2-3b, oppositely curved involutes are generated which can accommodate motion reversal. 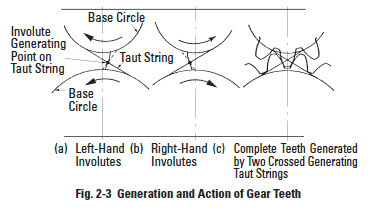 When the involute pairs are properly spaced, the result is the involute gear tooth, Figure 2-3c. Essential to prescribing gear geometry is the size, or spacing of the teeth along the pitch circle. This is termed pitch, and there are two basic forms. This relationship is simple to remember and permits an easy transformation from one to the other. Module m represents the size of involute gear tooth. The unit of module is mm. Module is converted to circular pitch p, by the factor π. 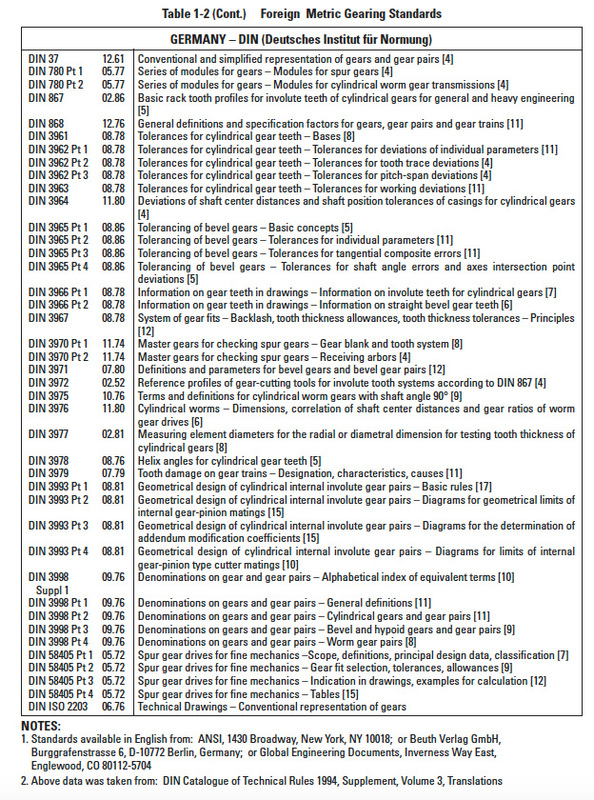 Table 2-1 is extracted from JIS B 1701-1973 which defines the tooth profile and dimensions of involute gears. It divides the standard module into three series. 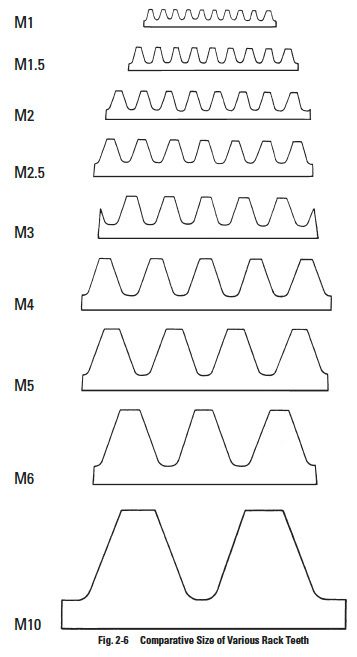 Figure 2-6 shows the comparative size of various rack teeth. 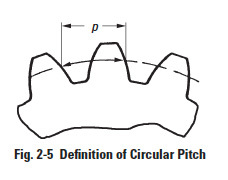 Circular pitch, p, is also used to represent tooth size when a special desired spacing is wanted, such as to get an integral feed in a mechanism. In this case, a circular pitch is chosen that is an integer or a special fractional value. This is often the choice in designing position control systems. Another particular usage is the drive of printing plates to provide a given feed. Most involute gear teeth have the standard whole depth and a standard pressure angle α = 20°. Figure 2-7 shows the tooth profile of a whole depth standard rack tooth and mating gear. It has an addendum of = 1m and dedendum ≥ 1.25m. If tooth depth is shorter than whole depth it is called a "stub" tooth; and if deeper than whole depth it is a "high" depth tooth. The most widely used stub tooth has an addendum = 0.8m and dedendum = 1m. Stub teeth have more strength than a whole depth gear, but contact ratio is reduced. On the other hand, a high depth tooth can increase contact ratio, but weakens the tooth.